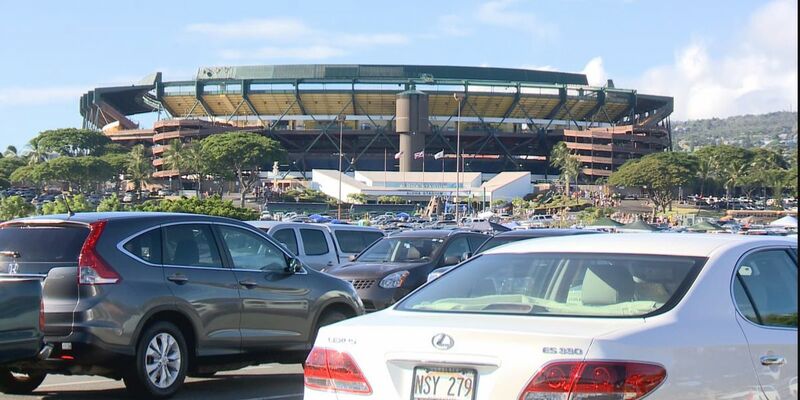 HONOLULU (HawaiiNewsNow) - Residents and businesses around Aloha Stadium are bracing for Bruno. In fact, they’ve been preparing for Bruno Mars' homecoming all week. Classes at Radford High School ended early — at 12:45 — Thursday so students and faculty could get home before the Bruno Mars madness began. Mars is wrapping wrap up his world tour with three sold-out shows in his home state. Some 36,000 spectators will pack the stands at each concert. Over at Stadium Mall, employees at the Stadium Camellia Restaurant say they are open an extra two hours Thursday to accommodate large groups of hungry fans. “Today, we have extra helpers to help us prepare more food,” said Shawn Dulatre, of the eatery. "The business should be booming over here. They say they usually only see this many reservations on holidays like Valentine’s Day and Mother’s Day. While Stadium Mall management says the parking lot is strictly for mall customers, the manager at Moanalua Pets says she’s worried the concerts next door may be bad for her business. “I’m sure we’re going to have a lot of angry and disappointed customers when they drive here after taking like an hour to get here,” said manager Debbie Shibuya. With limited concert parking, some local organizations are using the events as a fundraising opportunity. The Pau Riders of Hawaii were gifted 100 stalls at the Aiea Commercial Center for all three nights — and they hope to raise money for their upcoming trip to California. Besides driving, taxis, and ride sharing, there are also several shuttle services available. Roberts Hawaii says it sold close to 6,000 shuttle tickets and will be using more than a hundred of its buses.